Happy upcoming first full moon of the year! Interestingly, not only will this be the Wolf Moon, it’s a Super Wolf Blood Moon. Super Moon, in that it’s closest to the earth in its elliptical orbit; Wolf Moon, because that’s the name given to January’s moon; and Blood Moon because of the reddish tint that’s going to appear when, yes, a lunar eclipse occurs. Barring cloudy skies, here in Wisconsin this stargazer’s phenomenon should appear this Sunday, January 20, between 10:41 and 11:12 p.m. You can bet I’ll be outside watching for it! Back when people named moons according to the seasons, our northern ancestors hunkered themselves inside near a fire while wolves howled distantly in the January cold. Wolves are a common metaphor for hunger, yet families kept this wolf—hunger, that is—from their door with the food they’d put up earlier in autumn. These days, while in the cozy warmth of our homes, we’re browsing garden catalogs and dreaming of the spring months ahead when we can plant those first seedlings. The plans we make now shape the crops we grow in summer and the food we put up in fall, which in turn keeps “the wolves from our door” next winter. For self-employed farm entrepreneurs, winter is time to plan your seed purchases. It’s also time to promote your farm and sign up members for the upcoming growing season. Next month is the Midwest Organic & Sustainable Education Service (MOSES) Conference and I’m presenting a workshop that offers great ideas for promoting your farm. 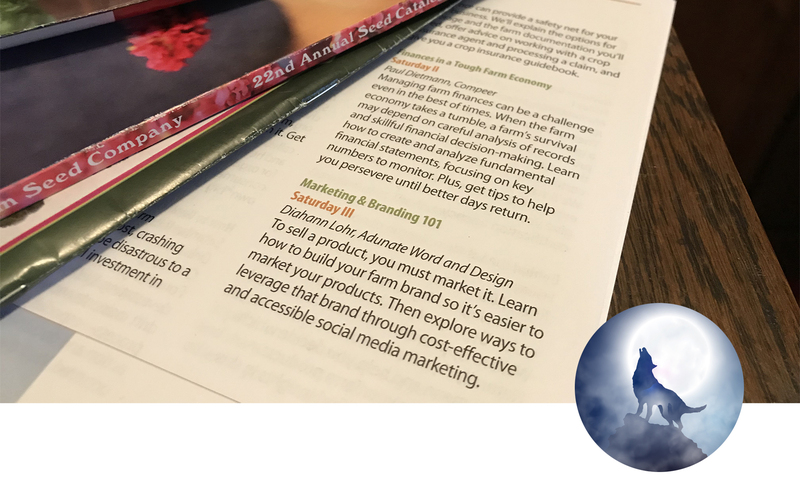 The workshop is Marketing & Branding 101 and will be Saturday, February 23, in La Crosse, Wisconsin. We’ll talk branding, because you have to brand yourself before you can market. We’ll then discuss marketing and how social media has become the easiest and most cost effective way to promote your small business. Hope to see you next month in La Crosse!